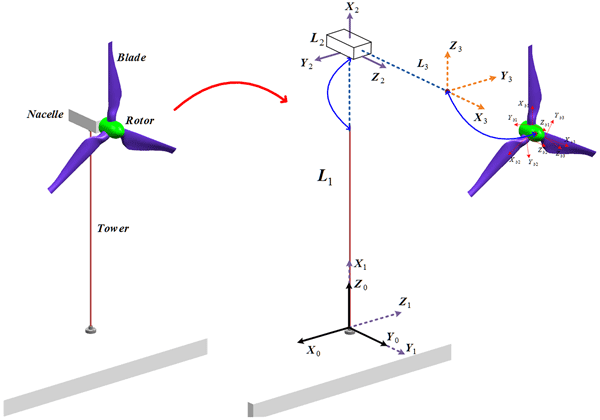 This paper studies the effect of the tower dynamics upon the wind turbine model by using mixed sets of coordinates within multibody system approach. The dynamics of wind turbine model is presented based on the floating frame of reference formulation. The mixed coordinates consists of three sets: Cartesian, elastic, and reduced-order modal coordinates for low speed components. Experimental validation has been carried out successfully, and the model can be utilized for design process. During the mode experiments of the FCRM, we find that the mode characteristics of the FCRM change with the different tip mass. As the direct drive source of the FCRM, the output of the motor also have great influences on the dynamic characteristics of the FCRM. Thus, the nonlinear modelling and dynamic stability of a FCRM with base disturbance and terminal load are analyzed in this paper. During the analysis process, the methods of mechanism modeling and numerical calculation are adopted. The mixing system of a certain type of concrete mixing truck is studied.A mathematical method for calculating the dynamic performance of the mixing drum is established.Results show that with the increase of rotating speed, the vibration amplitude of the mixing drum decreases.The peak amplitude moves to the right with the inclination angle increasing.The maximum unbalanced response amplitude increases with the decrease of concrete liquid level height,and the vibration peak moves to the left. Our work mainly focuses on the dynamic modeling of a piezoelectric actuator (PA) in the impact drive mechanism in the case of the in-pipe inspection application. The novel model we have developed is able to capture the inertia of the PA and the feature of this model is its computational efficiency with reasonable accuracy. This study has concluded that the inertia of the PA in such a robot can significantly affect the accuracy of the entire model of IDM. This paper provides a comprehensive review of the literature regarding the modelling and control of piezoelectric inertial-friction actuators (PIFAs). A general architecture of PIFA is proposed first to facilitate the analysis and classification of the literature. In addition, the paper presents the future directions in modelling and control of PIFAs for further improvement of their performance.